With the elections behind us and the legislative session ahead, the members of The Association of Retired Teachers of Connecticut (ARTC) want to congratulate the newly elected members of the legislature as well as those re-elected. We look forward to continuing our work in 2019 on behalf of 37,000 retired teachers. several popular myths about the benefits available to retired teachers. Our retirement benefits are dependent on legislative decisions and past government promises. Connecticut teachers do not contribute to Social Security; however, they do contribute 7 percent of their annual income to the Teachers Retirement Fund and 1.25 percent to their Health Insurance Fund with the belief that these funds will be sustained in their retirement years. In addition, they contribute 1.45 percent for Medicare. Retired teachers who do not have Medicare coverage pay approximately $400 up to $1,200 per person, per month. For health care, retirees monthly premium costs coupled with monies paid from their HIPA fund result in retired teachers paying the bulk of their own insurance coverage. Over the years, while teachers contributed to their retirement funds and health care costs, state budgets did not adequately contribute to the Teachers Retirement Fund and to the Health Insurance Fund. As a result, there is an unfunded liability of more than $13 billion in the Retirement Fund and approximately $200 million in default to the Health Fund. Unless these funds are maintained, Connecticut will no longer be able to attract and keep qualified educators to maintain its high standards of education. 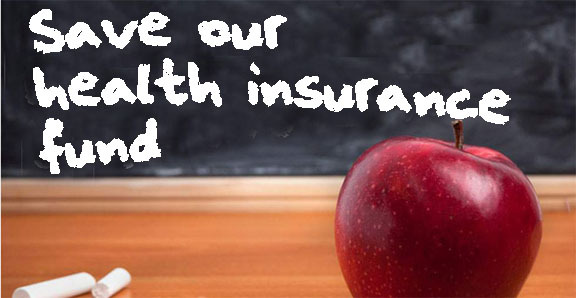 The latest projections indicate that, unless the legislature fully funds their statuary one-third share, the [Teachers Health Insurance Fund] will become insolvent in 2020. Our Health Insurance Fund is in a particularly urgent crisis. The latest projections indicate that, unless the legislature fully funds their statuary one-third share, the fund will become insolvent in 2020. This fund was established by retired teachers to help defray the cost of insurance premiums in their retirement years. To be clear, even with the state’s required contributions to this fund, retired teachers presently pay for most of their own insurance costs. In response to Connecticut’s financial condition, many news reports have focused on the State’s pension liabilities and the need to change government pensions. Many of these articles confuse the pension contributions of teachers with the pension contributions of state employees. These reports ignore the fact that teachers contribute a significantly larger portion of their salaries toward their pension and are not able to fully participate in the social security system. There is also a casual disregard for the fact that both retired teachers and state employees have paid their fair share to ensure a solvent system while state government has not. Presently the legislature is exploring ways to address the problem of adequately maintaining these funds. The legislature formed the Connecticut Pension Sustainability Commission to study the feasibility of placing state capital assets in a trust and maximizing those assets for the sole benefit of the state pension system. A proposal was made by the past administration to dedicate lottery assets to the cash-starved teacher retirement benefit fund. The Association of Retired Teachers of CT (ARTC) is open to these and other ideas designed to stabilize the pension system and pledges to work together with policymakers to achieve this. Ed Messina is the President of the Association of Retired Teachers of Connecticut.